It’s Friday so it’s Looking Good in the Garden. We are right in the middle of a storm. It’s been blowing a gale overnight and now even thought the sun is shining there’s a roaring above my garden studio as the wind whips through the bare branches of the oak trees. But Snowdrops are out in full force in our Bluebell Wood nodding their tiny heads in the high speed gusts. The first snowdrops flower in our garden in early January. It’s officially mid winter but to me the great white rafts of tiny snowdrops announce that winter is on the way out and spring is just around the corner. 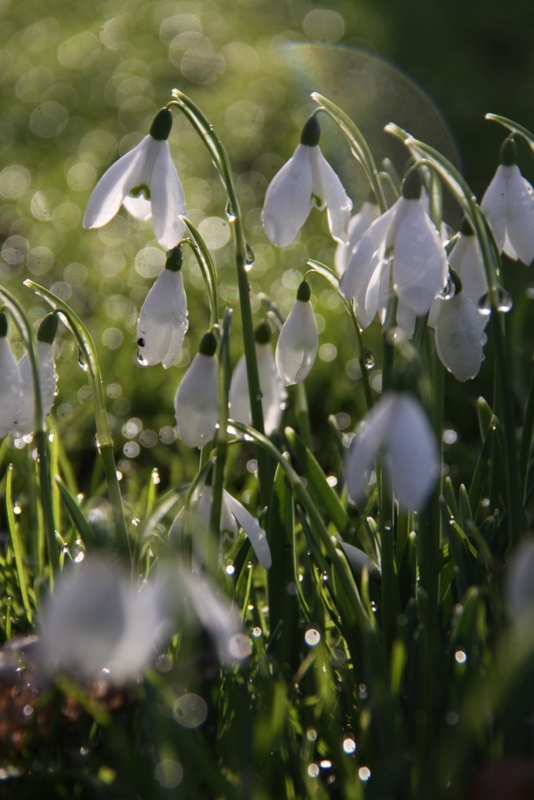 Snowdrops are a welcome sight during dull grey winter days. Especially today when it is blowing a gale! There are several distinct patches of them, all the same species as far as I can tell… it’s the common snowdrop Galanthus nivalis. In our garden the snowdrops in full sun always flower first and those in shady places flower later. We had just a few snowdrops when we first moved here. Since then they have multiplied and I’ve helped them on their way. Each year after flowering I dig up congested clumps and gently break them apart. Most books tell you to replant the bulbs individually but I prefer to plant a group of five or six together. It’s much quicker and they establish good clumps quickly too. In spite of storm Gertrude our Snowdrops are Looking Good in the Garden. Your snowdrops are looking lovely. They’re such cheerful plants at this time of year. We woke up to stormy weather too but have blue skies now. Thanks Susan. I agree they are cheerful little plants to have around in January. I think your winters are much more severe than ours Eliza! How lovely to have so many snowdrops. They look lovely with the dark Hellebores too. Yes we are very lucky I agree Annette! I love your snowdrops. It does take a few years to get some good clumps together but once they are established it is so easy to keep the numbers growing. Lovely. I split the clumps up and move them around and they self seed too… there are always a few new ones popping up in strange places! Snow drops! now there is something to look forward to, in the Southern Hemisphere however, its all about the roses! You are so lucky… I’m dreaming or warm sunny days. It’s grey and rainy here AGAIN! They are looking good Gillian, especially with those dark hellebores. And now we are on to Henry, it’ s just one storm after the other. Snowdrops and hellebores are indeed the joys of winter, what would we do without them? Yes it’s been quite wild here for a few days. It does seem to be easing off now but I must confess I have been thinking about the lovely warm sunny days we usually have in March today!